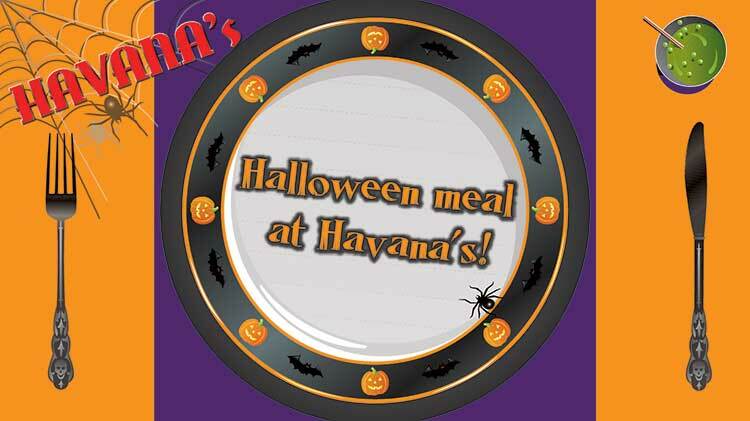 US Army MWR :: View Event :: Celebrate Halloween at Havana's! Date: Oct 31 2018, 11 a.m. - 2 p.m.
Come celebrate Halloween with Havana's and have the kids eat for free! Join us for a creeptastic menu complete with Wicked Witch Stuffed Potatoes, eerie Stuffed Jack-O-Lantern Bell Peppers, Gingered Orange Carrots, and a spooky side salad, with soda or tea! Children (12 & under) in costume get a free kids meal (value of $4.95) on Halloween with the purchase of an adult combo purchase of $7.95 or more. Dine-in only, limit one free kid's meal per adult combo purchase!